Shady, tree-lined neighborhoods are a maze of mismatched dinette sets and children’s toys. Stores are de facto shelters, diners and one-stop shops for donations and disaster assistance forms. 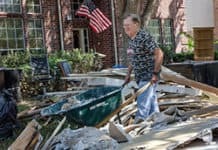 Times are hard, but one thing has emerged — a wave of community spirit and Christian servanthood as neighbors help neighbors and churches unleash armies of volunteers. This was her third flood. I did not ask why she stays, because it is her right to live where she chooses, and she owes neither me nor anyone else an explanation. For her, this yard, this house, this oak tree, is happiness. I see a clever sign. She sees birthday parties and prom date photos in the front yard. She sees her children’s tiny fingers and toes and smells the sweetness of walking in the front door with a brand new, fragile life in her hands. These things are not easy to leave. The scope of the devastation is staggering. Houston is the fourth largest city in the nation, bigger than the state of New Jersey with a population of more than 2.3 million within city limits and 6.5 million throughout the metro area. 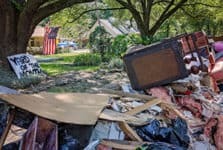 Across the state, Hurricane Harvey affected more than 6.8 million people in 18 counties. As the days pass, the damage and death totals continue to rise. So, too, do the number of volunteers. 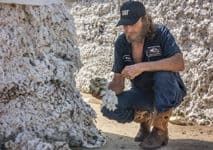 Keith Kresta, a Crescent cotton farmer, grew up on a farm and is accustomed to the capriciousness of weather. Already mid-harvest, when he saw the Colorado River rising, he hastened to prepare his crops, move his cattle to higher ground, load his furniture into trailers, and install a pipe ring and pump around his farmhouse. As darkness fell on Texas, there was nothing more Mr. Kresta could do. He had managed to harvest 60 percent of his 800 acres. After Katrina, blue tarpaulins fluttered in the breeze, trying to protect what little was left. In some places, the cheap tarp was the most expensive thing on the property. 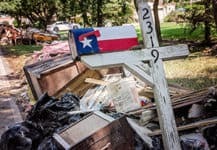 In Houston, salvation came in the form of white sheets, white t-shirts, white bandanas, white garbage bags — anything that could be tied to a car antenna, a windowsill, a rooftop, a branch. A sign of life. A sign of resignation. A sign of surrender. 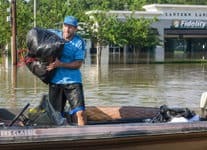 Are we asking too much of Houston’s volunteers? Susan Keays stands at the water’s edge and shades her eyes to better see an approaching boat. As she holds her cellphone, verifying an address, she quickly counts heads. One volunteer is missing. This morning, they were strangers. Now, they are a sort of family. She is on Memorial Boulevard, where kayaks and bass boats bob in a river that shouldn’t be. At first, she came to the edge of the flood to save horses. She is staying to save people.